Intel's groundbreaking 8008 microprocessor was first produced 45 years ago.1 This chip, Intel's first 8-bit microprocessor, is the ancestor of the x86 processor family that you may be using right now. I couldn't find good die photos of the 8008, so I opened one up and took some detailed photographs. These new die photos are in this article, along with a discussion of the 8008's internal design. The diagram below highlights some of the major functional blocks of the chip. On the left is the 8-bit Arithmetic/Logic Unit (ALU), which performs the actual data computations.3 The ALU uses two temporary registers to hold its input values. These registers take up significant area on the chip, not because they are complex, but because they need large transistors to drive signals through the ALU circuitry. Die of the 8008 microprocessor showing major components. Below the registers is the carry look ahead circuitry. For addition and subtraction, this circuit computes all eight carry values in parallel to improve performance.2 Since the low-order carry depends on just the low-order bits, while the higher-order carries depend on multiple bits, the circuit block has a triangular shape. The physical structure of the chip is very close to the block diagram in the 8008 User's Manual (below), with blocks located on the chip in nearly the same positions as in the block diagram. 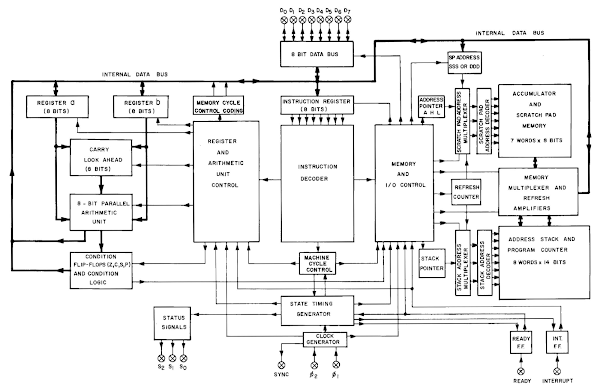 Block diagram of the 8008 microprocessor, from the User's Manual. What does the die photo show? For our purposes, the chip can be thought of as three layers. 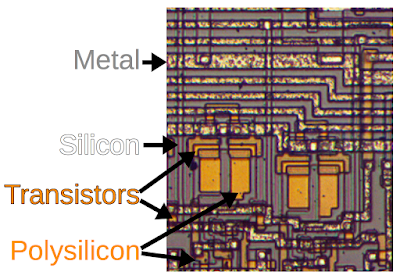 The diagram below shows a closeup of the chip, pointing out these layers. The topmost layer is the metal wiring. It is the most visible feature, and looks metallic (not surprisingly). In the detail below, these wires are mostly horizontal. The polysilicon layer is below the metal and appears orange under the microscope. A closeup of the 8008 die, showing the metal layer, the polysilicon, and the doped silicon. Transistors are the key component of the chip, and a transistor is formed where a polysilicon wire crosses doped silicon. In the photo, the polysilicon appears as a brighter orange where it forms a transistor. Why an 18 pin chip? There was no good reason to force the chip into 18 pins. Packages with 40 or 48 pins were common with other manufacturers, but 16 pins was "a religion at Intel".6 Only with great reluctance did they move to 18 pins. By the time the 8080 processor came out a few years later, Intel had come to terms with 40-pin chips. The 8080 was much more popular, in part because it had a simpler bus design permitted by the 40-pin package. The data bus provides data flow through the chip. 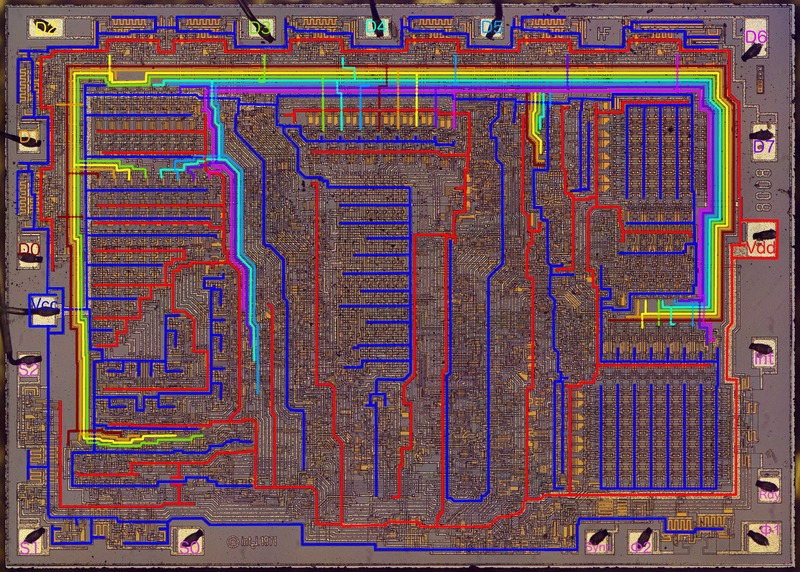 The diagram below shows the 8-bit data bus of the 8008 with rainbow colors for the 8 data lines. The data bus connects to the 8 data pins along the outside of the upper half of the chip. The bus runs between the ALU on the left, the instruction register (upper center), and the registers and stack on the right. The bus is split on the left with half along each side of the ALU. Die photo of the 8008 microprocessor. The power bus is shown in red and blue. The data bus is shown with 8 rainbow colors. The red and blue lines show power routing. Power routing is an under-appreciated aspect of microprocessors. Power is routed in the metal layer due to its low resistance. But since there is only one metal layer in early microprocessors, power distribution must be carefully planned so the paths don't cross.7 The diagram above shows Vcc lines in blue and Vdd lines in red. Power is supplied through the Vcc pin on the left and the Vdd pin on the right, then branches out into thin, interlocking wires that supply all parts of the chip. To show what the chip looks like in detail, I've zoomed in on the 8008's register file in the photo below. 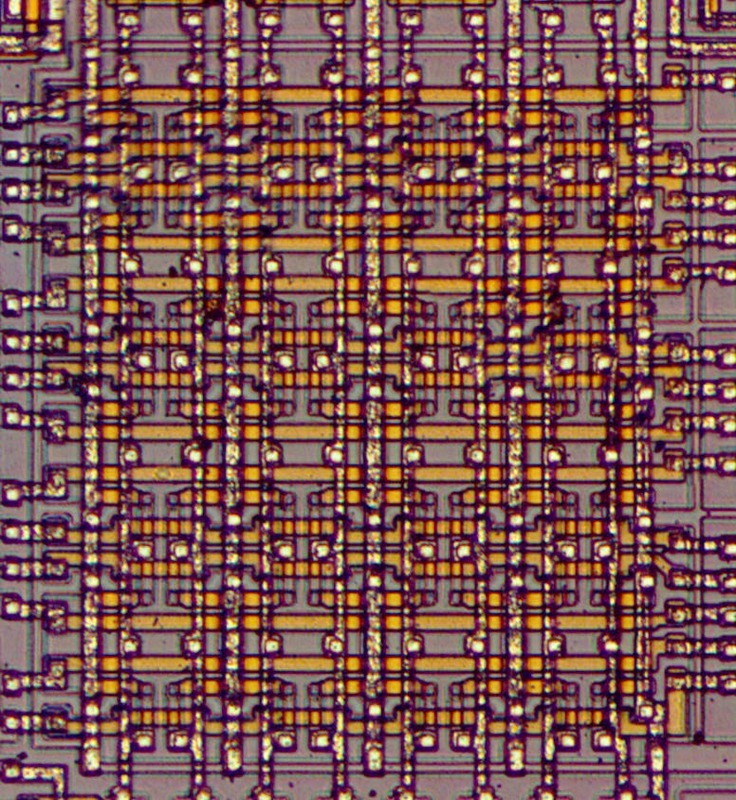 The register file consists of an 8 by 7 grid of dynamic RAM (DRAM) storage cells, each using three transistors to hold one bit.8 (You can see the transistors as the small rectangles where the orange polysilicon takes on a slightly more vivid color.) Each row is one of the 8008's seven 8-bit registers (A, B, C, D, E, H, L). On the left, you can see seven pairs of horizontal wires: the read select and write select lines for each register. At the top, you can see eight vertical wires to read or write the contents of each bit, along with 5 thicker wires to supply Vcc. Using DRAM for registers (rather than the more common static latches) is an interesting choice. Since Intel was primary a memory company at the time, I expect they chose DRAM due to their expertise in the area. 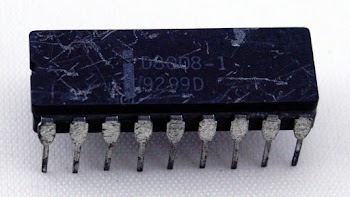 The 8008 uses PMOS transistors. To simplify slightly, you can think of a PMOS transistor as a switch between two silicon wires, controlled by a gate input (of polysilicon). The switch closes when its gate input is low and it can pull its output high. If you're familiar with the NMOS transistors used in microprocessors like the 6502, PMOS may be a bit confusing because everything is backwards. A simple PMOS NAND gate can be constructed as shown below. When both inputs are high, the transistors are off and the resistor pulls the output low. 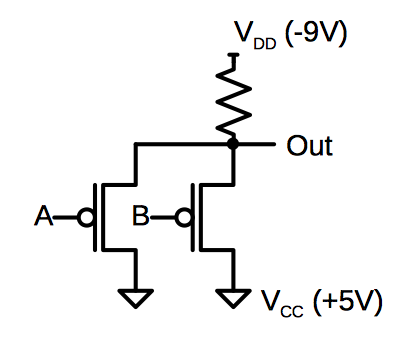 When any input is low, the transistor will conduct, connecting the output to +5. Thus, the circuit implements a NAND gate. For compatibility with 5-volt TTL circuits, the PMOS gate (and thus the 8008) is powered with unusual voltages: -9V and +5V. A NAND gate implemented with PMOS logic. For technical reasons, the resistor is actually implemented with a transistor. The diagram below shows how the transistor is wired to act as a pull-down resistor. The detail on the right shows how this circuit appears on the chip. The -9V metal wire is at the top, the transistor is in the middle, and the output is the silicon wire at the bottom. In PMOS, a pull-down resistor (left) is implemented with a transistor (center). The photo on the right shows an actual pull-down in the 8008 microprocessor. The 8008's complicated story starts with the Datapoint 2200, a popular computer introduced in 1970 as a programmable terminal. (Some people consider the Datapoint 2200 to be the first personal computer.) Rather than using a microprocessor, the Datapoint 2200 contained a board-sized CPU build from individual TTL chips. (This was the standard way to build a CPU in the minicomputer era.) Datapoint and Intel decided that it would be possible to replace this board with a single MOS chip, and Intel started the 8008 project to build this chip. A bit later, Texas Instruments also agreed to build a single-chip processor for Datapoint. Both chips were designed to be compatible with the Datapoint 2200's 8-bit instruction set and architecture. 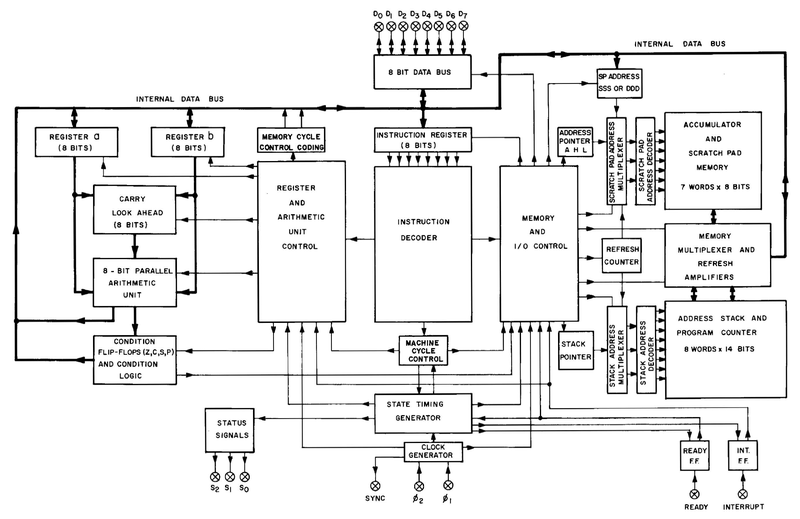 The 8008 processor was first described publicly in "Electronic Design", Oct 25, 1970. 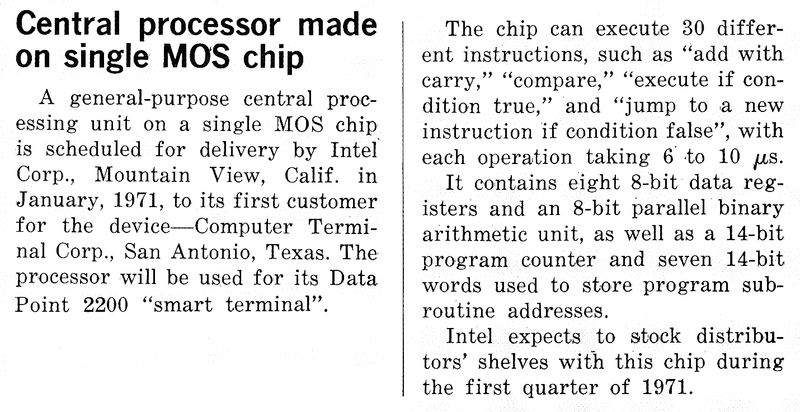 Although Intel claimed the chip would be delivered in January 1971, actual delivery was more than a year later in April, 1972. Around March 1971, Texas Instruments completed their processor chip, calling it the TMC 1795. 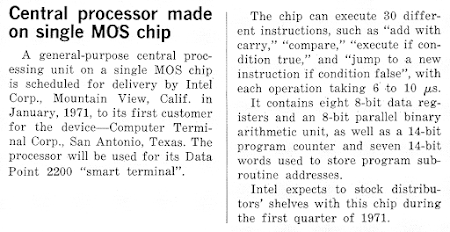 After delaying the project, Intel finished the 8008 chip later, around the end of 1971. For a variety of reasons, Datapoint rejected both microprocessors and built a faster CPU based on newer TTL chips including the 74181 ALU chip. TI tried unsuccessfully to market the TMC 1795 processor to companies such as Ford, but ended up abandoning the processor, focusing on highly-profitable calculator chips instead. Intel, on the other hand, marketed the 8008 as a general-purpose microprocessor, which eventually led to the x86 architecture you're probably using right now. Although TI was first with the 8-bit processor, it was Intel who made their chip a success, creating the microprocessor industry. A family tree of the 8008 and some related processors. Black arrows indicate backwards compatibility. Light arrows indicate significant architecture changes. The diagram above summarizes the "family tree" of the 8008 and some related processors.10 The Datapoint 2200's architecture was used in the TMC 1795, the Intel 8008, and the next version Datapoint 220011. Thus, four entirely different processors were built using the Datapoint 2200's instruction set and architecture. The Intel 8080 processor was a much-improved version of the 8008. It significantly extended the 8008's instruction set and reordered the machine code instructions for efficiency. The 8080 was used in groundbreaking early microcomputers such as the Altair and the Imsai. After working on the 4004 and 8080, designers Federico Faggin and Masatoshi Shima left Intel to build the Zilog Z-80 microprocessor, which improved on the 8080 and became very popular. The jump to the 16-bit 8086 processor was much less evolutionary. Most 8080 assembly code could be converted to run on the 8086, but not trivially, as the instruction set and architecture were radically changed. Nonetheless, some characteristics of the Datapoint 2200 still exist in today's x86 processors. For instance, the Datapoint 2200 had a serial processor, processing bytes one bit at a time. Since the lowest bit needs to be processed first, the Datapoint 2200 was little-endian. For compatibility, the 8008 was little-endian, and this is still the case in Intel's processors. Another feature of the Datapoint 2200 was the parity flag, since parity calculation was important for a terminal's communication. The parity flag has continued to the x86 architecture. The 8008 is architecturally unrelated to Intel's 4-bit 4004 processor12. The 8008 is not an 8-bit version of the 4-bit 4004 in any way. The similar names are purely a marketing invention; during its design phase the 8008 had the unexciting name "1201". 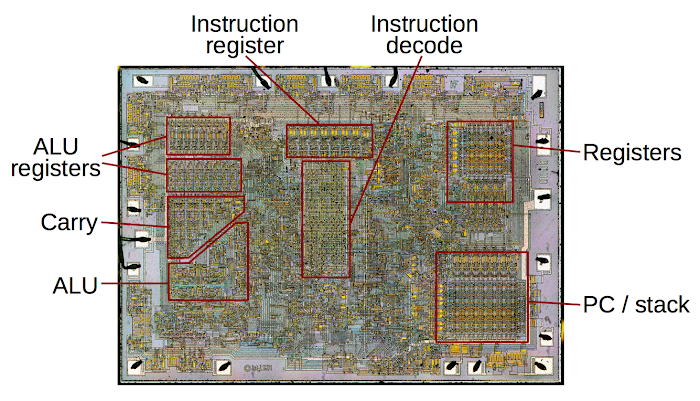 If you want more early microprocessor history, I wrote a detailed article for the IEEE Spectrum. I also wrote a post about TI's TMC 1795. The 4004 and 8008 both used silicon-gate enhancement-mode PMOS, a semiconductor technology that was only used briefly. This puts the chips at an interesting point in chip fabrication technology. The 8008 (and modern processors) uses MOS transistors. These transistors had a long path to acceptance, being slower and less reliable than the bipolar transistors used in most computers of the 1960s. By the late 1960s, MOS integrated circuits were becoming more common; the standard technology was PMOS transistors with metal gates. The gates of the transistor consisted of metal, which was also used to connect components of the chip. 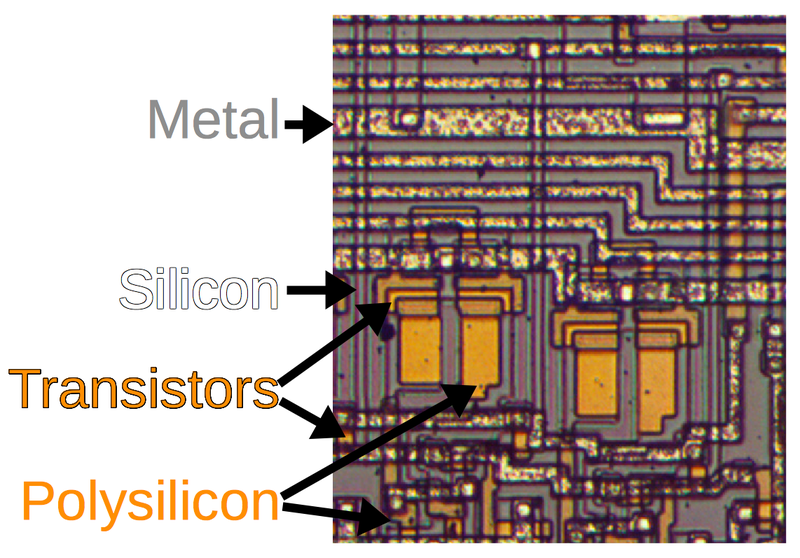 Chips essentially had two layers of functionality: the silicon itself, and the metal wiring on top. This technology was used in many Texas Instruments calculator chips, as well as the TMC 1795 chip (the chip that had the same instruction set as the 8008). A key innovation that made the 8008 practical was the self-aligned gate—a transistor using a gate of polysilicon rather than metal. Although this technology was invented by Fairchild and Bell Labs, it was Intel that pushed the technology ahead. Polysilicon gate transistors had much better performance than metal gate (for complex semiconductor reasons). 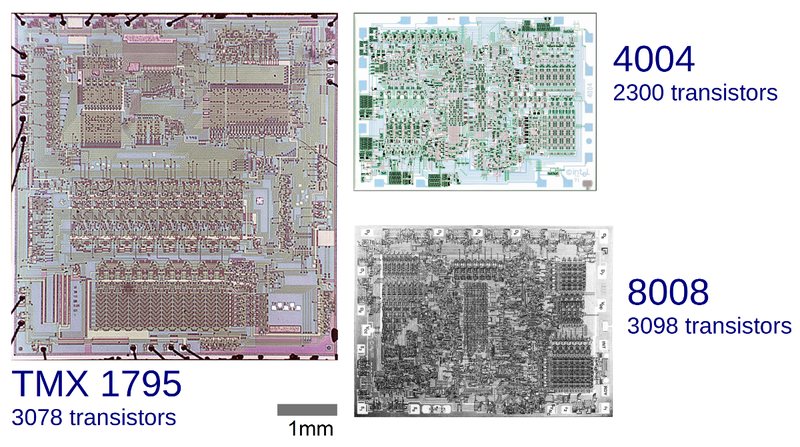 In addition, adding a polysilicon layer made routing of signals in the chip much easier, making the chips denser. The diagram below shows the benefit of self-aligned gates: the metal-gate TMC 1795 is bigger than the 4004 and 8008 chips combined. Intel's 4004 and 8008 processors are much denser than Texas Instruments' TMC 1795 chip, largely due to their use of self-aligned gates. TMC 1795 die photo courtesy of Computer History Museum. Shortly afterwards, semiconductor technology improved again with the use of NMOS transistors instead of PMOS transistors. Although PMOS transistors were easier to manufacture initially, NMOS transistors are faster, so once NMOS could be fabricated reliably, they were a clear win. NMOS led to more powerful chips such as the Intel 8080 and the Motorola 6800 (both 1974). Another technology improvement of this time was ion-implantation to change the characteristics of transistors. This allowed the creation of "depletion-mode" transistors for use as pull-up resistors. These transistors improved chip performance and reduced power consumption. They also allowed the creation of chips that ran on standard five-volt supplies.13 The combination of NMOS transistors and depletion-mode pull-ups was used for most of the microprocessors of the late 1970s and early 1980s, such as the 6502 (1975), Z-80 (1976), 68000 (1979), and Intel chips from the 8085 (1976) to the 80286 (1982). As you can see, the 1970s were a time of large changes in semiconductor chip technology. The 4004 and 8008 were created when the technological capability intersected with the right market. In this section, I explain how I got the photos of the 8008 die. The first step is to open the chip package to expose the die. Most chips come in epoxy packages, which can be dissolved with dangerous acids. Since I would rather avoid boiling nitric acid, I took a simpler approach. The 8008 is also available in a ceramic package (above), which I got on eBay. Tapping the chip along the seam with a chisel pops the two ceramic layers apart. The photo below shows the lower half of the ceramic package, with the die exposed. Most of the metal pins have been removed, but their positions in the package are visible. 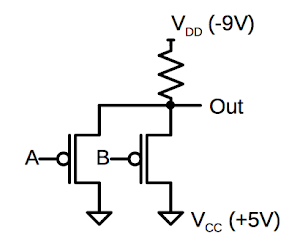 To the right of the die is a small square; this connects ground (Vcc) to the substrate. A couple of the tiny bond wires are still visible, connected to the die. Inside the package of the 8008 microprocessor, the silicon die is visible. Once the die is exposed, a microscope can be used to take photographs. A standard microscope shines the light from below, which doesn't work well for die photographs. Instead, I used a metallurgical microscope, which shines the light from above to illuminate the chip. I took 48 photographs through the microscope and then used the Hugin stitching software to combine them into one high-resolution image (details). 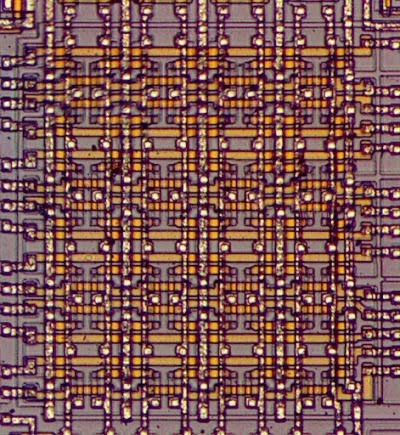 Finally, I adjusted the image contrast to make the chip's structures more visible. The original image (which is approximately what you see through the microscope) is below for comparison. 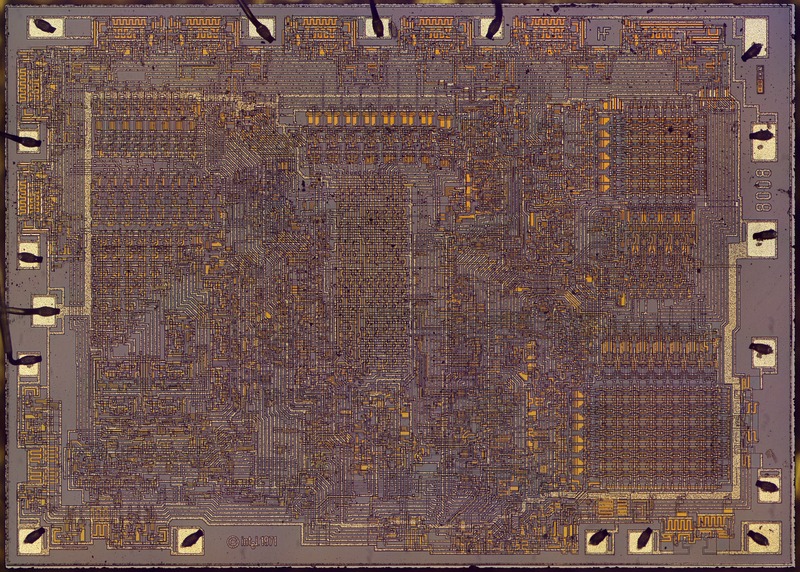 I took detailed die photos of the 8008 that reveal the circuitry it used. 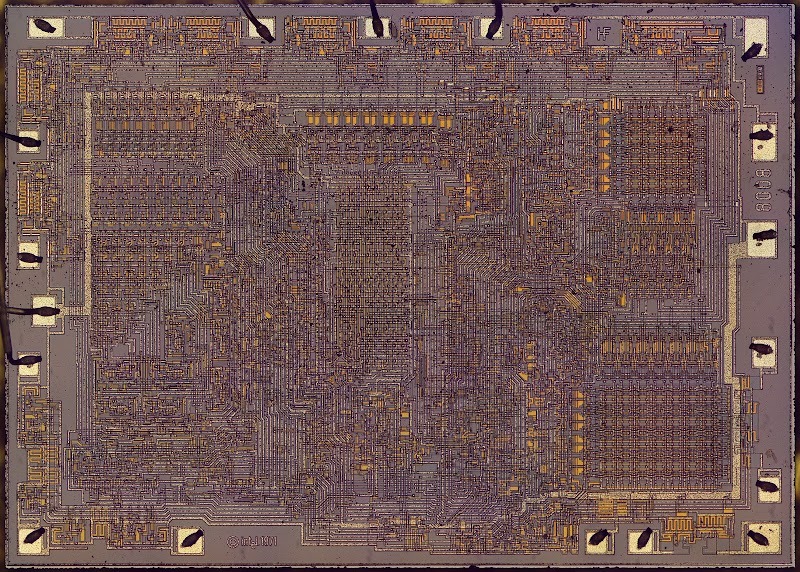 While the 8008 wasn't the first microprocessor or even the first 8-bit microprocessor, it was truly revolutionary, triggering the microprocessor revolution and leading to the x86 architecture that dominates personal computers today. 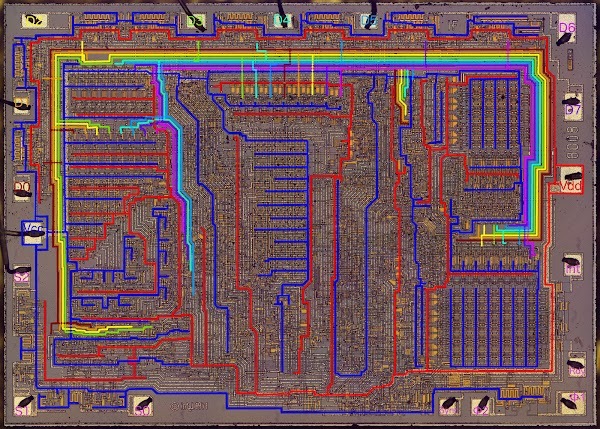 In future posts, I plan to explain the 8008's circuits in detail to provide a glimpse into the roots of todays computers. I announce my latest blog posts on Twitter, so follow me at kenshirriff. Or you can use the RSS feed. Great job Ken, that was a fascinating trip through the history that led up to writing my first 6502 assembly at 15 years old. I assume the first golden goose for Intel was getting the IBM contract, but I'm not sure how much of that was due to technical leadership, vs. other business reasons, vs just being in the the right time at the right place. "The 8008 was used in groundbreaking early microcomputers such as the Altair and the Imsai." I am not sure those computers were 8008 based. Wikipedia tells me both used 8080. Well written piece. I liked it very much. Anonymous: yes, that was just a typo. The Imsai and Altair used the 8080. My understanding is that IBM chose Intel over Motorola for the simple reason that the 8088 chip used DRAM, then I think it was 16K x 1 chips, 8 chips at a time. These were expensive. Motorola only later offered the a 68K chip with a smaller data bus. 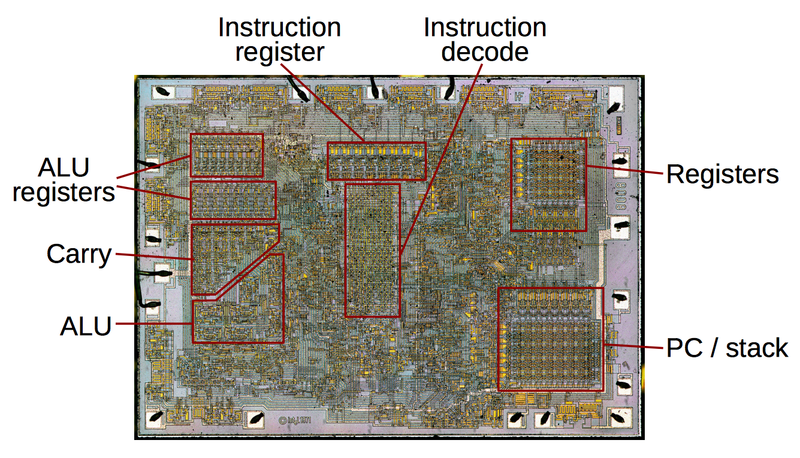 There were good reasons Intel might have chosen a 16-pin footprint for the 8008 chip. This was to be an expensive chip, compared to the TTL glue chips required to make the multiplexed busses work. There are design rules for the placement of bond pads on a die, there is a minimum distance apart in order to keep the bond wires apart. This was a little before my time, but I believe all chips at that time were manually assembled in packages, so the minimum spacing was probably significant. since the packages only had two rows of pins, it wa s bit difficult to get a lot of bond pads on all four sides of the chip. The chip designers had to work with package engineers to make it work. For each package pin count, there was a minimum die size in order to get all the bond pads on the chip. This was called a bond pad limited chip. I don't know the exact wafer size Intel used at that time, but it was very small and round, maybe 4 inches in diameter. The die size has an incredible impact on cost since the cost to produce a given wafer is fixed, the more die that fit on the wafer the lower the cost. I think we also have to keep in mind that at that time, there was no microprocessor market. This was just another chip, so Intel wouldn't have invested huge sums in specialized manufacturing and assembly gear, unlike today. Nice article as ever, Ken! Another typo, I think: "When any input is high..." should be "When any input is low..."
Ed: you're right, that's a typo. I'm used to NMOS and have a hard time thinking in PMOS. The high-res die photo is a beautiful shot in its own right - you could probably sell a few through some printing service (Zazzle, Cafe Press). I think the choice of 8088 for the PC was partly driven by the DisplayWriter team in Austin using the 8086, but mostly the MC68000 being only available in a 64-pin ceramic package. I was in Boca about that time, and Motorola came to press their case for the MC68000 architecture, but wanted to base their bid on the soon-to-be available 68008 40-pin plastic version, using multiplexed buses. Unfortunately it was several months too late for the decision makers. The 64-pin ceramic package was difficult to solder - the sheer size meant the ceramic cracked because of thermal stress in wave solder - so a socket would have to be added to the BOM and they were expensive because the pins on the ceramic package were gold plated, which meant the sockets had to be gold-plated as well .. all added to the cost. There were others in IBM who wanted Boca to adopt one of the IBM own designs - in particular UC0 or UC1 used in the 3274 controllers. Boca had a fantastic team of people in place to protect the PC development team from IBM Corporate involvement, and they helped Boca make its own independent decisions on processor, on component procurement and on testing and manufacturing practices. Don Estridge built a team who had such strong belief in their own decisions that the rest of IBM were both incredibly frustrated, and hugely impressed all at once. high resistance, or low leakage. John: you want the cross-under to be low resistance, measuring from one side of it to the other. If you make it thin, you're essentially making a resistor, which is bad. So it ends up being somewhat wide, and wasting space. Maybe you're thinking of the resistance between the cross-under and the metal it is going under. You want that to be high resistance, of course, which is easy since the oxide is a good insulator. "You can see dark lines along the border between doped silicon and undoped silicon." Very Interesting read. Have worked with these MPs but first time got to see such detailed HD Pics.